Nice pub, decent food – not quite gastropub, but good menu selection and friendly staff. I’m not a massive burger fan, I don’t eat them very often and I rarely manage to finish a whole one; I’ve had some bad experiences with burgers you see – they’re either too big, too greasy, or just plain meh. 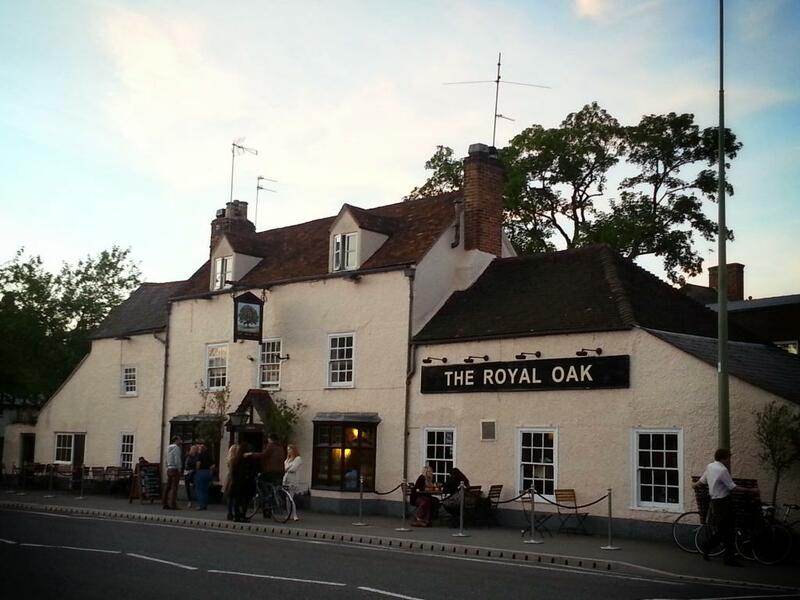 Over the past few months though, I’d seen pictures of some tasty looking burgers being served up at The Royal Oak Oxford; and I have to say, they were having an impact on me – I was actually starting to want one. Upon hearing they were launching a weekly burger day, I checked out the menu – Pork & Chorizo Burger with Caramelised Onion; Handmade British Brie & Bacon Jam Burger; Handmade British Beef Burger topped with Pork Belly and Black Pudding… that was it, I was finally tempted back to the dark side. Parking in St Giles’ with ‘A’, we took a walk up Woodstock Road to the Royal Oak. Set back a few feet from the road, the pub is recognisable by its pale pink exterior; once inside, it’s a rabbit warren of rooms – we must have walked through about five or six to get to our table. With warm wooden floors, mismatched wooden furniture and the odd wooden beam, you feel a real sense of history here; don’t get me wrong though, the place doesn’t feel dowdy. With walls and wooden panelling painted in various Farrow & Ball’esque shades, plenty of scatter cushions and the odd ‘statement’ piece of wallpaper, the pub feels inviting and cosy. Anyway, back to the food… there was a daily menu plus a specials menu, but we weren’t interested – we wanted to sample the burgers. ‘A’ and I had already decided we would order two different burgers and share them between us, so we could sample more. Scanning our way through the menu we decided on the Pork & Chorizo Burger with Caramelised Red Onion & Fries, plus a Handmade British Cheese Burger & Fries with added BBQ Pulled Pork, along with a side of onion rings. Asking the cheery waiter if any salad came with the burgers, we were advised coleslaw was provided, so left it at that. The only thing noted at this point was that we weren’t asked how we would like our burgers cooked; I’m usually a medium to medium-rare kind of gal, but for now I need well done, which was also the way ‘A’ wanted hers. A good old gossip later, we started looking at our watches, I’m purely guessing (because we forgot to check our watches when we ordered), but it must have been around half an hour by this point – not quite enough to annoy, but certainly enough to recognise hunger pangs. Five to ten minutes later the food arrived and sauces offered; we had to remind the waiter at this point we’d also ordered onion rings, which he chased up keenly for us. 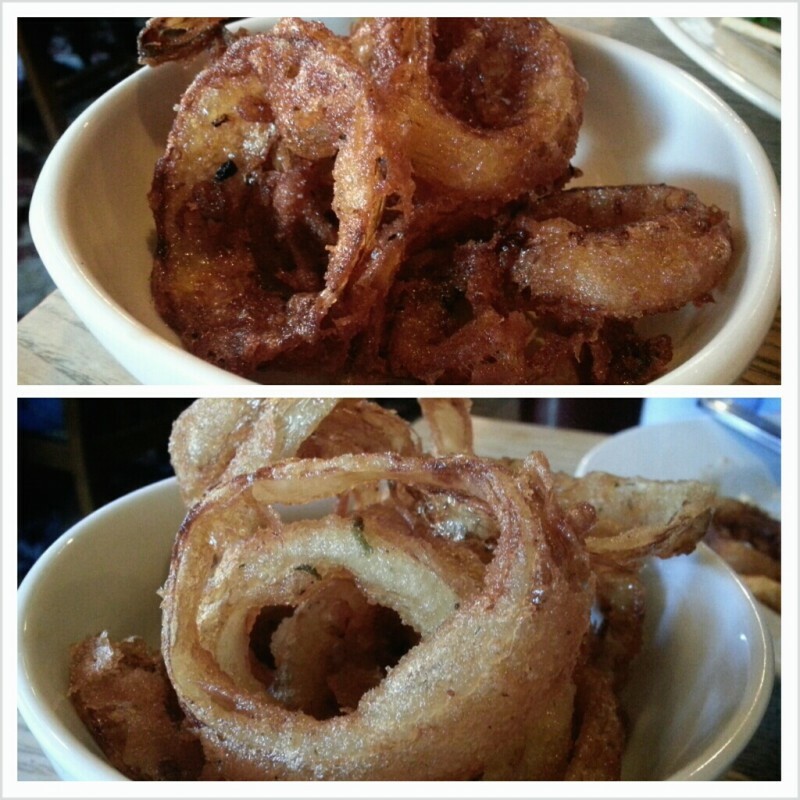 Onion rings delivered, we got stuck in. The Pork & Chorizo Burger had good flavouring, but for me felt a little dry, I would have preferred it with more caramelised onion; the fries were tasty, although a little too cool for our liking; the accompanying burger sauce was delicious – really good for dipping the chips in, although it was disappointing to not see the promised coleslaw on the side. The shining star for me? 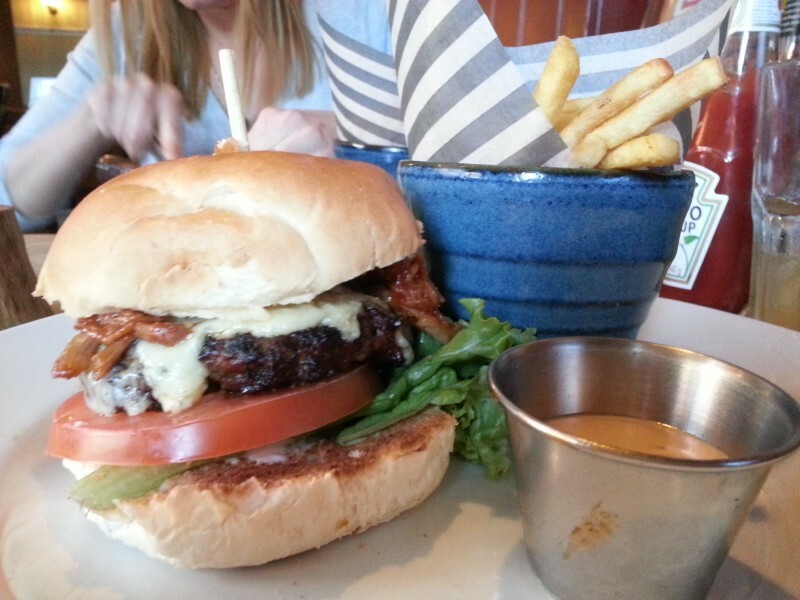 The Cheese Burger with addition of BBQ Pulled Pork was gorgeous – juicy, smoky, cheesy, gooey, deliciousness. Both burgers turned out to be well done, which was fortunate on this occasion, as otherwise we would have had to send them back; however please don’t automatically give me well done meat when I’m no longer pregnant, as I will be sick to death of it! Overall, the burgers were very enjoyable and not so big you’re left feeling you should be rolled out the door; we didn’t have room for pudding, but we both agreed we would certainly go back for more on another occasion. The only real disappointment we had was the onion rings; as you’ll see from the pic below, we had two batches, as we had to send the first back. Badly overcooked, the initial onion rings we received were brittle and greasy – not enjoyable at all; the second batch was certainly better, but still a little too greasy. It was good of the waiter to organise a replacement for us though, and he’d knocked them off the bill at the end as a gesture of goodwill – thumbs up on the customer service. All in all, a good meal; maybe not amazing, but I actually think they’ve got a very good foundation to build on. With a few tweaks, this could turn into a destination pub for me; get those onion rings sorted, heat up the fries a bit more and I’m there – I’m certainly looking forward to checking out the Handmade British Brie & Bacon Jam Burger when I’m not pregnant. What the hell, turns out I do like burgers after all! Who would’ve thought it. As an FYI, Monday night is also quiz night, so don’t expect it to be quiet. There is a PA system running throughout the building, so if you do want to take part in the quiz, you can do so from anywhere in the pub.